Find artworks, auction results, sale prices and pictures of Dante Gabriel Rossetti at auctions worldwide. Dante Gabriel Rossetti (British, 1828-1882) The Sisters signed with monogram (lower right) pen and brown ink 15.6 x 9.4cm (6 1/8 x 3 11/16in). Executed circa 1856 Footnotes Provenance P. & D. Colnaghi & Co. Ltd., London, by 1948. E. Schreisheimer. L. G. Duke. William Darby, London. Private collection, New Zealand (acquired from the above in 1971). Exhibited Eton College, 1948, no. 42. Stone Gallery, Newcastle, 1974 (according to a label on the reverse). Literature Virginia Surtees, The Paintings and Drawings of Dante Gabriel Rossetti, A catalogue raisonne, Oxford, 1971, p. 226, no. 704. 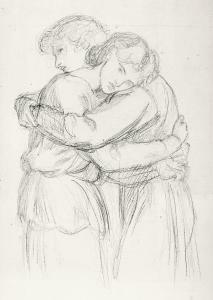 SKETCH OF LOVERS FOR THE BLESSED DAMOZEL Dante Gabriel Rossetti 1828-1882 pencil 33 by 24cm., 13 by 9½in. Provenance John Alexander Fuller Maitland (1856-1936), noted music critic and scholar; Sotheby\’s, London, 30 January 1991, lot 294, where purchased by the present owner Catalogue Note This is a sketch for one of the pairs of embracing lovers reunited in Paradise, on the left-side of the background of Rossetti\’s second version of The Blessed Damozel painted between 1875 and 1879. 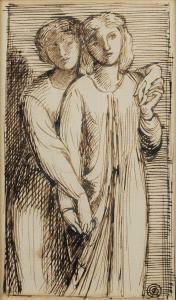 Rossetti made many sketches for the eleven pairs of entwined figures, three of which are in Birmingham City Art Gallery, one at the British Museum and another at the National Museum of Wales (others have appeared at auction, Swann Galleries, New York, 20 September 2018, lot 140, another Christie\’s, London, 13 July 2016, lot 113 and another Christie\’s, London, 16 June 2015, lot 50). There is a detailed drawing of all of the figures together at the Fogg Art Gallery in Harvard. Dante Gabriel Rossetti (1828-1882) The Three Fates signed with monogram (lower right) pen and brown ink on black-edged writing paper, with fragmentary watermark 5 5/8 x 7 ¼ in. 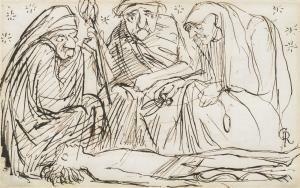 (14.3 x 18.4 cm.) Provenance William Bell Scott. Alice Boyd. Penkill Castle, Ayrshire; Sotheby's, 3 December 1962, lot 112. with Maas Gallery, London. Mrs Ronald Marshall, Newcastle-upon-Tyne, with The Stone Gallery, Newcastle-upon-Tyne. Anonymous sale; Christie's, London, 29 January 1980, lot 152, where purchased by the present owner. DANTE GABRIEL ROSSETTI Diligentia. Brush and colored ink on paper. 297x221 mm; 11 3/4x8 3/4 inches. Initialed in brown ink, lower center recto. In 1861, Rossetti became a founding partner of the decorative arts firm Morris, Marshall, Faulkner & Co., along with William Morris, Edward Burne-Jones, Philip Webb, Ford Madox Brown, Peter Paul Marshall and Charles Faulkner. 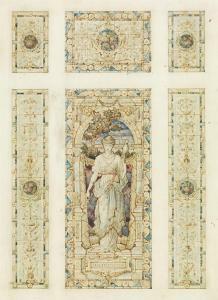 His contributions to the venture included numerous designs for stained glass windows and other decorative objects. Dante Gabriel Rossetti THE RETURN OF TIBULLUS TO DELIA 1828-1882 bears a monogram and date 1851 l.r.andtitled and inscribed by the artist with eight lines in Latin from \‘Tibullus\’ on the reverse watercolour with bodycolour on board 24 by 31.5cm., 9½ by 12in. Provenance Given by the artist to Fanny Cornforth (Mrs Schott) and by her given to Charles Fairfax Murray; Siddons Gallery, Paddington Green where purchased by Mr Terence W.G. Rowe, London in 1946; The Stone Gallery, Newcastle-Upon-Tyne, 1971; Lionel Jacobson; Hartnoll & Eyre, London 1974 where purchased by Seymour Stein Exhibited The Rossetti Gallery, London 1883, no.10; London, Leighton House, 1960, The Pre-Raphaelite Influence, 1960, no.71; London, Royal Academy, Rossetti Exhibition, 1973, no.252 Literature Virginia Surtees, Dante Gabriel Rossetti 1828-1882 – The Paintings and Drawings, A Catalogue Raisonne, vol.I., p.24, cat.no.62 incorrectly dated to 1853, illustrated vol.II, no.56 Catalogue Note \‘Live chaste, dear love; and while I\’m far away, Be some old dame thy guardian night and day. She'll sing thee songs, and when the lamp is lit, Fly the full rock and draw long threads from it, So, unannounced, shall I come suddenly, As 'twere a presence sent from heaven to thee.' Tibullus, Elegies In August 1851 Rossetti wrote in a letter; \‘I have at the moment two subjects en train – one from Dante\’s Vita Nuova, and one from the Poems of Tibullus.\’This makes the present pictureone of Rossetti\’s very earliest watercolours, the other picture referred to in the letter probably being Beatrice Meeting Dante at a Marriage Feast, Denies him her Salutation (private collection). The model for Delia was Elizabeth Siddall, Rossetti\’s tragic auburn-haired muse and future wife, who first met the artist in 1850. 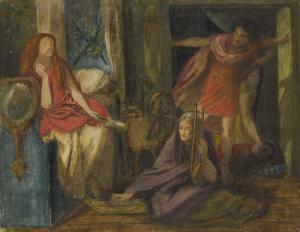 This watercolour was among Rossetti\’s earliest use of her as a model for a watercolour and one of the studies for this figure was later used by him as the basis for Beata Beatrix which was a posthumous memorial of his love for her following her suicide. As Delia, Rossetti cast \‘Lizzie\’ as the loyal lover patiently waiting for Tibullus to return to her – just as Lizzie had to wait for Rossetti to propose. Ironicallythis watercolour belonged to Rossetti's mistress Fanny Cornforth.